What Else is New With Marijuana Banking? ; Another Credit Union ADA Victory; Help Us Help You! A couple of weeks ago, I blogged about what's new with marijuana banking. Among other things, I provided an update on one credit union's ongoing efforts to become the first credit union chartered to support the marijuana industry and with a field of membership focused on cannabis groups. In response to my post, several credit union industry players reached out to ask how many cannabis-friendly credit unions are currently handling marijuana-related accounts. Who's Holding All That Cannabis Money? Recent reports indicate that legal marijuana sales reached $9.7 billion across the seven states where recreational marijuana was legal and Canada in 2017. That number does not include California, which is projected to hit $3.7 billion in legal cannabis sales by the end of 2018, and $5.1 billion in 2019. Overall, despite continued federal prohibition here in the U.S., North American legal cannabis sales are expected to hit $24.5 billion by 2021. Because the substance continues to be illegal under the federal Controlled Substances Act, marijuana businesses have remained challenged in obtaining traditional financial services but information from the Treasury Department indicates that more institutions are taking on these accounts. According to FinCEN's Marijuana Banking Update, based on Suspicious Activity Report (SAR) filings, around 400 depository institutions were actively banking marijuana businesses in the U.S. as of September 30, 2017. Less than 100 of those were credit unions, while the rest were banks. FinCEN's data shows that the agency received a total of 39,025 SARs using key phrases associated with marijuana-related businesses by the end September 2017. While the number of institutions serving marijuana businesses has more than tripled since 2014, federal data shows that only a small percentage of the 5,573 federally-insured credit unions across the country are reporting service to marijuana businesses. The growing industry will likely continue to be underbanked as long as cannabis continues to be federally illegal. On March 5, in another win for the credit union industry, a federal district court in Virginia granted a credit union's motion to dismiss an Americans with Disabilities Act (ADA) website accessibility suit. See, Carroll v. ABNB Federal Credit Union, No. 2:17-cv-521 slip. op. (E.D. Va. Mar. 5, 2018). NAFCU filed an amicus brief in this case; we have filed five briefs so far in support of our member credit unions. As discussed in the latest issue of NAFCU's Compliance Monitor, for the past year credit unions have faced a growing litigation threat due to unclear website accessibility standards under the ADA. To date, NAFCU is aware that credit unions in at least 24 states have been impacted by ADA website accessibility claims. In the latest case to be thrown out, the court found that "because [the plaintiff] has not shown that he (1) is a member of [the credit union], (2) that he is within [the credit union's] membership field, or (3) that he could become a member of [the credit union]," the plaintiff had not alleged a "sufficiently concrete injury in fact" necessary to show legal standing. See, Carroll v. ABNB Federal Credit Union, No. 2:17-cv-521 slip. op. at 8 (E.D. Va. Mar. 5, 2018). The court's reasoning regarding the plaintiff's standing was consistent with two other recent decisions in virtually identical suits alleging website violations of the ADA by other credit unions. See, Griffin v. Department of Labor Federal Credit Union, 1:17-CV-1419, slip op. (E.D. Va. Feb. 21, 2018); Carroll v. Northwest Federal Credit Union, l:17-cv- 01205, slip op. (E.D. Va. Jan 26, 2018). In addition, cases against two Texas credit unions (involving the same plaintiff) were dismissed on March 2. NAFCU also filed an amicus brief in support of one of those credit unions. Please visit NAFCU's ADA webpage to learn more about this issue, and to keep apprised about what NAFCU is doing to fight for credit unions. Monthly Research Survey: Help Us Help You! NAFCU's Economic and Research Team conducts monthly surveys of NAFCU member credit unions in order to compile meaningful data reports that you can use to benchmark against your geographic and asset level peers. These survey results are also critical to NAFCU's advocacy efforts on your behalf to federal agencies, such as NCUA, CFPB and the Federal Reserve. Your participation helps us help you! Today is the last day to share your voice on the topic of Financial Literacy & Community Outreach. We rely on your survey responses for our industry analysis and legislative advocacy efforts on behalf of all credit unions. Greetings! A little while ago, Stephanie blogged about the perils of being a non-member and the limited rights of nonmember joint-account owners. But do these rights extend to nonmembers in the case of co-applicants on a loan? In this day and age of hyper-connectivity and transient travel, credit unions can stand to lose some business if potential borrowers were not permitted to solicit help from a slightly more credit-worthy friend with the unfortunate reality of falling outside of the credit union's field of membership. This blogpost will address the permissible roles nonmembers can play in the loan application process. "The terms co-maker, co-borrower, co-signer, guarantor, and joint applicant sometimes create a degree of confusion. In general, these terms refer to one of two possible parties, either a co-maker or a co-signer. A co-maker shares equal responsibility with the borrower for payment of the loan and receives an equal benefit in the loan proceeds, or access to future advances in an open-end loan. Regulation B (202.7(d)(1)) identifies a co-maker as a joint applicant and the resulting loan as joint credit. A co-signer takes on liability for the obligation of another person without receiving goods, services, or money in return or, in an open-end credit obligation, without receiving the contractual right to obtain extensions of credit under the obligation. Credit unions request a cosigner’s signature as a condition for granting a member credit or as a condition for forbearance on collection of a member’s obligation in default. The co-maker shares in the loan proceeds and bears joint liability for repayment. Thus, a credit union cannot make a loan to a nonmember co-maker. However, a credit union may permit a nonmember to sign a loan, provided the nonmember does so in the capacity of a guarantor (cosigner), rather than a loan recipient (co-maker.)" NCUA Examiner's Guide, Chp. 10 at page 39. So there you have it. It appears that co-makers are required to be members, whereas nonmember friends can be co-signers. After all, that's what friends are for! Despite fears to the contrary, the deductions for interest paid on home equity loans and for private mortgage insurance were mostly preserved in the recent Tax Cuts and Jobs Act (TCJA) and corresponding tax extenders bill. The IRS issued new guidance earlier this week on the deduction for home equity loans as well as the deduction for mortgage insurance premiums. The Instructions for Form 1098 and General Instructions provide guidance on amending Form 1098. For additional information, we recently blogged about some of the major components of TCJA that affect credit union operations. Until next time compliance friends! "Friday Fun: Regulatory Requirements for Online Account Openings"
Greetings, Compliance Friends! Opening accounts online is a major convenience for members. However, for compliance officers, the online account opening process is riddled with potential pitfalls. For example, when and how does the credit union provide the account opening disclosures. Today's blog is meant to be a high-level review of some of the relevant requirements credit unions may want to consider when establishing online account opening policies and procedures. From a BSA standpoint, opening accounts online can represent risks related to a credit union's Customer Identification Program (CIP) and Know Your Customer requirements. Generally, a credit union's CIP program is based on its own risk assessment and not prescriptive requirements. Although, from a CIP perspective, members opening accounts online is generally considered higher risk. From NAFCU's understanding, many financial institutions utilize complex vendor software in order to ensure the CIP requirements are met when individuals seek to open accounts online. The FFIEC BSA/AML exam manual discusses "non documentary" methods of verifying identity that may also be helpful to the credit union. Note, the BSA requires that the credit union know the member's identity with reasonable certainty and have the member's name, address, date of birth and identification number so that guides what needs to be verified. However, a consumer must fall within the field of membership before they can be admitted as a member in the credit union. This determination will depend on the credit union's statement of its field of membership, the clause of the statement relied on by the potential member, and the credit union's policies and procedures. Note, Article II, Section 2 of NCUA's FCU Bylaws requires a member to sign an application for membership. The credit union might verify this language in its own bylaws, and if it does appear, consider electronic signatures under the E-SIGN Act or whether it will require a member to come in and provide a wet signature for the signature card and to establish insurance under Part 745. As an additional reference, NCUA Opinion Letter 2004-0543 discusses electronic signatures in the membership context. The E-Sign Act requires credit unions to receive the member's affirmative consent to receive electronic records. See, 15 U.S.C. § 7001(c). . As an industry standard, it seems many credit unions require members to comply with the E-SIGN consent and procedures when registered for online banking to give legal effect to the disclosures transmitted to the members through the online banking platform. For more information, NCUA issued a Risk Alert soon after the E-SIGN Act became effective in March 2001. Here is an additional link for your reference: Consumer Compliance Outlook 4Q Article on ESIGN . The determination whether a credit union is required to provide additional disclosures when a member establishes an account online depends on what other types of products or services the member is requesting. For example, if the member requests a debit card to execute electronic fund transfers, then the credit union would need to comply with Regulation E.
NCUA's Truth in Savings Rule has a similar requirement that specifies that credit union must provide account opening disclosures before the account is opened or a service is provide din connection with the account. See, 12 C.F.R. § 707.4(a)(1)(ii). Under the GLBA, Initial Privacy Notices and Opt-Out Notices can be provided electronically. The notieces can be delivered pursuant to the E-SIGN Act, or in certain circumstances, the notices can be delivered when the consumer is conducting transactions electronically. Under section 1016.9(b)(1)(iii), it is considered valid delivery to post the privacy notice on a website and require the consumer to acknowledge receipt of the notice as a necessary step to obtaining a particular financial product or service. Another privacy consideration for online banking is the Children’s Online Privacy Protection Act (COPPA). COPPA imposes certain requirements on operators of websites or online services directed to children. Credit unions are subject to COPPA if they operate a website or online service directed to children, or have actual knowledge that they are collecting or maintaining personal information from a child online. Making COPPA determinations generally requires an analysis of the specific facts and circumstances surrounding a credit union’s online activities against the requirements of COPPA. Thus, a credit union may want to work with local counsel to see if COPPA applies. The FTC’s website has an excellent overview of COPPA. Lastly, there may be state law considerations. An online banking agreement establishes contractual obligations between the credit union and the member. The credit union may consider consulting with local counsel to develop a comprehensive agreement that includes, but is not limited to: balance and transaction information; password creation and maintenance; access authorization; and technical assistance. NCUA Official Sign is required on a webpage where a credit union accepts deposits or opens accounts under section 740.4(a). Downloadable graphics of the sign are available here. Regulation CC requires the credit union to provide disclosures relating to funds availability “before opening a new account,” under section 229.17. FFIEC IT Booklets provides guidance on cybersecurity considerations. Back to Basics: Are All Members Created Equal? With reportedly 108 million credit union members, it's no secret that credit unions are a terrific choice for American consumers seeking financial services. Credit unions are member-owned, not-for-profit cooperative financial institutions that provide local communities with key financial products. Unlike banks, which operate with the purpose of maximizing shareholder profits, credit unions operate with the purpose of returning benefits to their member-owners in the form of lower interest rates on loans and higher returns on savings and deposits. According to an independent study released by NAFCU earlier this year, the cumulative benefit credit unions provide the greater economy totals over $16 billion per year. Of course, to benefit from the advantages of credit union membership, individuals must be eligible to join a credit union. Usually, this means a person falls within a credit union's field of membership. A federal credit union's field of membership may include individuals who share a common bond of occupation, association, or community. But if a person doesn't directly qualify for membership, they may still be eligible to join because of a close relationship with someone who does qualify. There are two types of credit union members: primary and secondary (or derivative) members. The way an individual may qualify for credit union membership depends on whether that person is a potential primary member or a potential secondary member. NCUA's chartering and field of membership rules allow a federal credit union the discretion to include in its field of membership (FOM) "other persons eligible for credit union membership," including among others, "members of the immediate family or household." The Chartering and FOM Manual defines "immediate family" as "spouse, child, sibling, parent, grandparent, or grandchild. This includes stepparents, stepchildren, stepsiblings, and adoptive relationships." In addition, "household" is defined as "persons living in the same residence maintaining a single economic unit." This definition includes any person who is a permanent member of and participates in the maintenance of the household, including family members, domestic partners, foster children, and legal guardian relationships. Roommates in a single residence would also meet this definition, but a fraternity, sorority, or nursing home relationship would not. See, NCUA Letter to Federal Credit Unions 99-FCU-2, p. 23. If such "other persons" are included in the credit union's FOM, both "primary" and "secondary or derivative" membership in the credit union is permitted. NCUA has issued a number of legal opinions discussing the meaning and parameters of both primary and secondary membership. Those opinions explain that an individual that is within a federal credit union's FOM is eligible for membership as a primary member. Immediate family and household members of the primary member, because of their close relationship to the federal credit union's common bond group, are considered potential secondary or derivative members of the credit union. See, NCUA Legal Opinion 97-1020. "Membership eligibility is extended only to individuals who are members of an “immediate family or household” of a credit union member. It is not necessary for the primary member to join the credit union in order for the immediate family or household member of the primary member to join, provided the immediate family or household clause is included in the field of membership. However, it is necessary for the immediate family member or household member to first join in order for that person's immediate family member or household member to join the credit union." (Emphasis added). Thus, where a federal credit union has included the immediate family or household member clause in its field of membership, the immediate family and household members of a primary individual may join the credit union as long as the primary individual is within the credit union's FOM at the time the family or household member joins the federal credit union. In other words, immediate family and household members are allowed to join a federal credit union even if the primary individual is not a member, as long as the primary individual is currently within the federal credit union's FOM. However, if the primary individual leaves the FOM without having become a member, the immediate family or household members of the primary individual are no longer eligible to join the credit union. See, NCUA Legal Opinions 97-1020; 98-0404. On the flip side, if an immediate family or household member of a primary individual joins the credit union and, subsequently, that primary individual leaves the FOM, the family member can stay with the credit union. Under the "once a member always a member" policy, immediate family or household members can maintain their membership in a federal credit union even if the primary individual is no longer within the field of membership. See, NCUA Legal Opinion 97-1020. For example, in the circumstance where a primary individual dies, NCUA has opined that immediate family or household members that have already joined a federal credit union through their relationship to the primary individual within the credit union's common bond may continue their membership after that individual's death. See, NCUA Legal Opinion 97-1019. Keep in mind that there are other ways to qualify for secondary membership, aside from a close family or household relationship. For example, "other persons" like volunteers, by virtue of their close relationship with a sponsor group, may also be included in the credit union's FOM. Finally, remember that eligibility alone is not enough to establish credit union membership. Under the Federal Credit Union Act, membership in a federal credit union requires an approved membership application and payment and maintenance of at least a par value share (as well as any applicable entrance fee). See, 12 U.S.C. §1759(a); FCU Bylaws, Article III. The 10th Circuit Court of Appeals has revived the efforts of Colorado-based The Fourth Corner Credit Union (Fourth Corner) to become the nation's first cannabis credit union. The credit union, chartered under an obscure provision in Colorado law that permits the state financial services commissioner to grant a charter so long as the credit union has "applied for" share insurance, was formed in 2014 to serve the state's legalized marijuana industry and its supporters. On June 27, in a 2-1 majority opinion, the appellate court overturned the district court's ruling in the credit union's lawsuit against the Federal Reserve Bank of Kansas City (Fed Bank) after the bank denied Fourth Corner's application for a master account. Vacating the district court’s order and remanding with instructions dismiss the amended complaint without prejudice, the divided 10th Circuit panel decision essentially gives Fourth Corner another shot at applying to the Fed Bank for a master account, which could pave the way for the credit union to finally open its doors for business. In 2012, Colorado, along with Washington, became the first states in the nation to legalize recreational marijuana under state law. However, under the Controlled Substances Act (CSA), marijuana remains a Schedule I substance, which makes it illegal under federal law to manufacture, distribute, or dispense marijuana. See, 12 U.S.C. §812(b)(1). As such, despite legalization under state law, financial transactions involving proceeds from marijuana-related activity can still form the basis for federal criminal prosecution. As discussed in a prior blog post, this conflict between federal and state law presents a significant challenge to financial institutions in providing banking services to marijuana-related businesses (MRBs). As a result, MRBs that are operating legally under state law remain largely unbanked and typically operate as cash-only businesses, increasing public safety risks. In late 2014, Fourth Corner sought to address this banking void by forming a state-chartered credit union to exclusively serve MRBs and supporters of legalized marijuana in the state of Colorado. According to its Facebook page, the credit union's mission is "to [provide] compliant banking services to those who share a common bond of support for the legalized marijuana industry." After getting the green light from the Colorado financial services commissioner, the newly-chartered credit union planned to open its doors in Denver in early 2015. But the credit union's momentum was short-lived. In July 2015, NCUA denied Fourth Corner's application for federal share insurance and, shortly after, the Fed Bank denied Fourth Corner's application for a master account, basing its denial, in part, on NCUA's insurance denial. In response, Fourth Corner filed suit against the Fed Bank and NCUA in two related actions essentially alleging that "The NCUA and [the Fed Bank] acted in concert to unlawfully block [Fourth Corner] from gaining access to the Federal Reserve payments system," which the credit union deems is crucial to its operations. See, Complaint, The Fourth Corner Credit Union v. National Credit Union Administration. Indeed, without access to a master account, the credit union cannot access the Fed's payments system to electronically transfer funds. In short: no master account, no business. In December 2015, the U.S. District Court for the District of Colorado dismissed, with prejudice, Fourth Corner's lawsuit against the Fed Bank. Fourth Corner had asked the court for a mandatory injunction directing the Fed Bank to grant it a master account, but the court declined to grant such relief, finding that "courts cannot use equitable powers to issue an order that would facilitate criminal activity." See, Dismissal Order, The Fourth Corner Credit Union v. Federal Reserve Bank of Kansas City. While acknowledging that the "situation [is] untenable," the district court nevertheless concluded that the credit union's stated purpose in providing financial services to MSBs violated the CSA and "[a] federal court cannot look the other way" just because "financial institutions don’t mind violating the law." See, Dismissal Order. Fourth Corner appealed the decision to the U.S. Court of Appeals for the 10th Circuit, which heard oral argument on the matter in November 2016. In a deeply divided decision, the three-judge panel of the 10th Circuit issued three separate opinions that overlapped on some points, but were in direct conflict on others. Essentially, however, the appellate court vacated the lower court’s order and directed the district court to dismiss the amended complaint without prejudice. In short, the decision allows Fourth Corner to reapply to the Fed Bank for a master account and to have the case heard again if the bank denies that request. The court also noted that according to statute the Fed Bank must indiscriminately make Federal Reserve services available to "all depository institutions." See, 12 U.S.C. § 248a(c). "The district court dismissed the amended complaint, reasoning that Fourth Corner would use the master account to violate federal drug laws. This ruling was erroneous. The district court should have presumed that Fourth Corner would follow the court’s determination that servicing marijuana-related businesses is illegal. And in the amended complaint, Fourth Corner essentially promised to obey the law that would be set out in the eventual declaratory judgment. In these circumstances, the district court had little reason to jettison the standard on a motion to dismiss and rely instead on suspicions about what Fourth Corner would do." (Emphasis added). Basically, the appeals court found that the district court relied on mere suspicions about what Fourth Corner might do, which was an insufficient standard to approve a motion to dismiss. In other words, the appellate decision comes with a big caveat—while Fourth Corner may serve marijuana industry supporters and advocates, it may not serve MSBs that are illegal under federal law. What does this mean for marijuana banking? Given Fourth Corner's original goal of bringing vital financial services to unbanked MSBs, the 10th Circuit decision is only a limited win for the would-be credit union. The credit union is now presumably free to adjust its business plan, reapply for a master account and, if granted, to open for business to serve legal-marijuana advocates and other individuals and groups within its field of membership that it may legally serve under federal law. But here's the thing—regardless of the disposition in court, the credit union was already able to serve those legally innocuous groups. The key, of course, has always been the ability to serve MSBs that are legal under state law but illegal under federal law. Viewing the decision through that lens, it's hard to say that the 10th Circuit ruling has moved the ball forward for marijuana banking. In fact, the decision may have brought the conflict of laws into even sharper focus. "Today, two of the three panel members hold that servicing marijuana-related businesses remains illegal under federal law. With this holding by a panel majority, Fourth Corner will know that servicing marijuana-related businesses is illegal." (Emphasis added). Oh, and don't forget that Fourth Corner's lawsuit against NCUA is still pending. While the Colorado state financial services commissioner appears to have hinted that a denial of federal share insurance is not necessarily fatal to the credit union's business plan, a court ruling in favor of NCUA would certainly raise yet another roadblock for the embattled credit union. Thus, while Fourth Corner has indicated that it will move forward in pursuing a master account, the credit union—and marijuana banking in general—continues to face a long and difficult road ahead. NCUA's Office of General Counsel recently issued its first legal opinion of 2017. The new opinion, NCUA Legal Opinion 17-0406, addresses the question of whether, under NCUA's recently revised Chartering and Field of Membership Manual (Chartering Manual), several islands separated by a body of water would be considered "contiguous" for purposes of NCUA's rural district regulation. See, Appendix B to Part 701. The opinion concludes that the presence of a body of water in a geographic area does not preclude the area from satisfying the definition of “contiguous” in the rural district provisions of the Chartering Manual. The opinion highlights the important role of credit unions in "providing access to our national system of cooperative credit to persons who reside in rural areas," given that "[r]esidents of rural communities across America are in need of affordable financial services and often do not have ready access to such services." See, NCUA Legal Opinion 17-0406. The Federal Credit Union Act provides that a federal credit union’s membership field may be comprised of "persons or organizations within a well-defined local community, neighborhood, or rural district." See, 12 U.S.C. 1759(b). The boundaries of the well-defined rural district do not exceed the outer boundaries of the states that are immediately contiguous to the state in which the credit union maintains its headquarters (i.e., not to exceed the outer perimeter of the layer of states immediately surrounding the headquarters state). See, Appendix B to Part 701, Chapter 2, Section V.A.2 (Emphasis added). In this instance, the geographic area under consideration consisted of several Hawaiian islands that encompass parts of each of the five counties in Hawaii. Four out of the five counties in Hawaii are on separate islands or groups of islands. Based on an analysis of the geographic area's specific characteristics, NCUA concluded that the area met the population, population density, perimeter, and geographic boundary criteria in the rule, therefore qualifying as a permissible rural district under its chartering and field of membership rules. NCUA noted that the term "rural district" is not statutorily defined, giving NCUA "broad authority to [define that term] as the agency determines is appropriate." See, NCUA Legal Opinion 17-0406. Further, the agency pointed out that nothing in its definition of "rural district" suggests that the presence of a body of water precludes the existence of a rural district. Thus, NCUA concluded that the proposed area—which covers certain parts of Hawaii, Honolulu, Maui, Kauai and Kalawao counties—is "contiguous" and qualifies as a rural district, despite the body of water separating the islands. It is important to note that NCUA's conclusion with respect to whether this particular area of islands qualifies as "contiguous" is narrowly limited to the definition of that term for purposes of the rural district regulation and the unique factual circumstances of the proposed area of Hawaiian islands. In other words, credit unions should be careful in drawing broad conclusions that any other area of islands will necessarily qualify as contiguous for purposes of satisfying the rural district requirements in the Chartering Manual. The key takeaway from this opinion, however, is NCUA's position that separation by a body of water in a geographic area does not preclude the area from satisfying the definition of “contiguous” in the rural district provisions. Indeed, citing Manhattan and Staten Island and the Kahului-Wailuku-Lahaina metropolitan statistical areas (MSA) as examples, NCUA notes that a number of MSAs designated by the Office of Management and Budget transcend bodies of water. Moreover, the territorial boundaries of census maps often extend into bodies of water, and rivers and other bodies of water often completely separate metropolitan areas. Thus, while qualification of a particular area as a rural district is always a fact-specific determination, NCUA's latest opinion makes it clear that a geographic area that is divided by a body or bodies of water is not prevented by that fact from qualifying as contiguous for purposes of meeting NCUA's rural district requirements. NAFCU has received questions on some of the issues addressed in the Q&As so I selected a few to highlight this morning. Does the rule allow a credit union serving one MSA to expand to a separate MSA if it can demonstrate common interests, particularly if the MSA is adjacent to our existing FOM? Yes, if both Metropolitan Statistical Areas are part of the same Combined Statistical Area. A proposed community may also include an immediately adjacent area falling outside of the CSA. To include the adjacent area, the credit union must submit a narrative providing compelling evidence of interaction or common interest. NCUA will issue guidance to help credit unions develop a written narrative. As a community chartered credit union, does our service area have to be adjacent to a MSA that is under 2.5 million people to serve it? Yes, the adjacent area must be contiguous to your existing community area, and the population as a whole must not exceed 2.5 million. A credit union can add an immediately adjacent area falling outside a Single Political Jurisdiction, Core-Based Statistical Area or Combined Statistical Area. To add the adjacent area, the credit union must develop a written narrative showing compelling evidence of interaction or common interests. Is there a limit of one adjacent area to a defined area? No. A proposed community may include the addition of more than one immediately adjacent area falling outside of a Single Political Jurisdiction, Core-Based Statistical Area or Combined Statistical Area, as long as the proposed community meets the other statutory requirements of being a well-defined local community. Is a shared branch considered an acceptable ability to serve members as a means for a credit union to expand its field of membership? It depends. If the shared branch meets the definition of a “service facility,” which is defined as a place where shares are accepted for members’ accounts, loan applications are accepted or loans are disbursed, it would qualify. This definition includes a credit union owned branch, a mobile branch, an office operated on a regularly scheduled weekly basis, a credit union owned ATM, a video teller machine, or a credit union owned electronic facility that meets, at a minimum, these requirements. A service facility also includes a shared branch or a shared branch network if either: (1) the credit union has an ownership interest in the service facility either directly or through a CUSO or similar organization; or (2) the service facility is local to the credit union and the credit union is an authorized participant in the service center. What do we need to submit for a housekeeping amendment to add SEG contractors? What is meant by “strong dependency relationship” in the new Inclusion of SEG Contractor Rules? The rule defines a “strong dependency relationship” between a SEG sponsor and the sponsor’s contractor to mean that both rely on each other as measured by a pattern of regularly doing business with each other. This can be demonstrated, for example, as documented by the number, the term length and the dollar volume of prior and pending contracts between them. The “strong dependency” standard is to be established by credit unions themselves, so as to create a rebuttable presumption that the sponsor's employees and those of the contractor share a single common bond, as the Federal Credit Union Act requires. Do you need to list each business and the number of employees at the sites? No. However, NCUA Form 4015-EZ should identify the total number of tenant employees being requested. In addition, the letter from the Office or Industrial Park representative needs to address the below three conditions. In a strip mall, if a tenant leaves and another tenant moves in, do we need to submit another application to add the new tenant that moved in? No. However, the employees of the new tenant that moved in are only eligible to join the credit union if the above three tenant conditions are met. If an entity is no longer a tenant of the strip mall, the tenant’s employees would also no longer be eligible to join the credit union. Members of record who joined the credit union while working at the facility for former tenant may continue to be served. Would an authorized representative of an industrial park include a property management company? Yes. Either the owner of the office or industrial park, or an authorized representative for the leasing agent or property management company could be an authorized representative for the office or industrial park. In yesterday's press release, NCUA also said that "by May" it "expects to have new guidance, including examples and resources" to help federal credit unions "prepare requests" to amend their fields of membership. In the meantime, these Q&As are a helpful start in the interim for FCUs who are evaluating how the FOM rule change might create opportunities for growth. NAFCU will keep members posted but in the meantime, feel free to send us specific questions so we can help. The "Great Blizzard" of 2017. Last week, we had a bit of a snow event in the DC metro area. While weather reports indicated that we could receive a decent snowfall, we ended up with about 4 inches or so. I took Nolan to one of our local grocery stores after work that day, and it was badly picked over. As a native of Ohio, I just had to laugh – and take pictures to share so that some of you further north can chuckle at our region's expense. Welcome to 2017! Shake off that holiday sugar-hangover, and have a look at the upcoming field of membership changes. Last month, I wrote about the changes to the field of membership rules for community common bond charters. Now, with just a few weeks before NCUA’s modernized field of membership rules go into effect, let’s focus on the changes for multiple common bond charters. The proposed rule included five changes for multiple common bond charters, three of which became final as proposed (more or less): the inclusion of contractors in SEGs, streamlined stand-alone feasibility determination processes and the addition of veterans as an affinity group. Currently, a single common bond federal credit union (FCU) can include employees of contractors involved with the sponsor of the charter if there is a “strong dependency relationship” between the contractors and the sponsor. The final rule creates a parallel allowance for multiple common bond chartered FCUs to add employees of contractors who have a strong dependency relationship with a SEG sponsor. In this context, a “strong dependency relationship” is a relationship in which the entities rely on each other as measured by a pattern of regularly doing business with each other, for example, as documented by the number, the term length, and the dollar volume of prior and pending contracts between them.” See, 81 Fed. Reg. 88412, 88435 (December 7, 2016). NCUA stated that it intends that FCUs will determine whether a contractor and sponsor meet this standard themselves, so as to create a rebuttable presumption. NCUA anticipates issuing further guidance to clarify what documentation is acceptable to establish a contractual relationship based on a pattern of regularly doing business. See, 81 Fed. Reg. at 88421. Under the current Chartering and Field of Membership Manual, when an FCU seeks to add a group of potential members that numbers 3,000 or greater, it must perform a stand-alone feasibility determination establishing that the proposed group does not have the ability to form their own credit union. Under the new rule, the documentation involved will be reduced and the process will be streamlined. The approach will be tiered based on the size of the group, with separate processes for groups of fewer than 3,000 members, groups between 3,000 and 4,999 members, and groups of 5,000 or more. This change is the result of complaints to NCUA that this process involves excessive paperwork and that large groups have withdrawn from the application process in frustration. See, 81 Fed. Reg. at 88422. Lastly, NCUA finalized the proposed rule to permit FCUs to include honorably discharged veterans of any branch of the United States Armed Forces as an affinity group. This affinity group applies only to veterans; retirees of other groups, such as teachers or federal employees must be permitted by the FCU’s charter. See, 81 Fed. Reg. at 88422. NCUA had issued a proposal allowing tenants of an office park or industrial park to be considered a SEG able to be added to a multiple common bond chartered FCU’s field of membership. After receiving comments on the proposal, NCUA decided that the ability to add the tenants of an office park or industrial park as a SEG would not comport with the Federal Credit Union Act, as the landlord is not typically the tenants’ employer and the tenants lack a true common bond. However, NCUA also stated it believes the existing rule already permits tenants to become individual SEGs, thus allowing all employees of such a park to become members. To clarify the current availability of the multiple common bond option for employers within the same park, NCUA added it as a factual example within the Manual. See, 81 Fed. Reg. at 88421. "To be able to have this type of clause in its charter, the multiple common bond credit union first must receive a request from an authorized representative of the group or the park to establish credit union service. The park must be within the multiple common bond credit union's service area, and each occupational group must have fewer than 3,000 employees, who are eligible for membership only for so long as each is employed by a park tenant. Under this clause, a multiple common bond credit union can enroll group employees only while the group's retail or business employer is a park tenant, but such credit unions are free to serve employees of new groups under the above conditions as each respective employer becomes a park tenant." See, 81 Fed. Reg. at 88435. In addition, any new tenants to the industrial park would be eligible for membership so long as they meet those two conditions. In the proposal, NCUA attempted to modify the definition of “service facility” to include an FCU’s website or mobile platform, assuming it can perform certain functions. This was a potential change many credit unions were excited about. Unfortunately, the NCUA Board did not approve this change in the final rule, though it stated the proposal had merit. The Board decided to defer this change to a later date, after further study. See, 81 Fed. Reg. at 88420. Here’s to another year of credit union excellence in 2017! We hope to hear from all our NAFCU-member credit unions with their compliance questions and what they need to make 2017 the year of working smart, not hard. We are here for you, please don’t hesitate to reach out! This Friday is your last chance to save $300 on any of our compliance training events. Get certified. Get compliance confidence. Use code “HOLIDAY” when you register. NCUA’s efforts to modernize the field of membership rules have finally started to come to fruition. On Wednesday, NCUA’s field of membership final rule was published in the Federal Register at 81 Fed. Reg. 88412. Based on this publication date, the effective date for the final rule is February 6, 2017. The final rule contains changes for community common bond charters in four areas: the “core area” service requirement, the population limitation, combined statistical areas and the addition of an area adjacent to the core-based statistical area. In the proposed rule, there was a fifth area, adding individual statewide congressional districts as a well-defined local community, but NCUA deferred action on this issue to a later time. Currently, community charter applications for part of a core based statistical area (CBSA) are acceptable to NCUA provided 1) they include the dominant core city, county, or equivalent and 2) that the CBSA's population in its entirety is 2.5 million or less people. Under the new rules, the requirement that a portion of the CBSA include the dominant core area is being repealed. This requirement is not mandated by the Federal Credit Union Act. NCUA decided to repeal it stating that federal credit unions (FCUs) have been successful in providing services to low-income and underserved populations whether they are in a core area or not. See, 81 Fed. Reg. 88412, 88413. The 2.5 million people population limitation currently applies to the entire CBSA, even when a credit union seeks only to serve a part of the CBSA. Under the new rule, the 2.5 million population cap will no longer apply to the CBSA’s population in the entirety. Instead, the cap will apply to the portion of the CBSA the credit union seeks to serve. See, 81 Fed. Reg. 88414. Also, NCUA issued a proposed rule that would increase this cap to 10 million. See, 81 Fed. Reg. 78748, 78751. Under the current rule, there are two kinds of “presumptive communities” that automatically qualify as well-defined local communities: 1) a single political jurisdiction and 2) a core based statistical area (CBSA). The final rule adds a third presumptive community: a combined statistical area. A combined statistical area is two or more continuous CBSAs that have a substantial employment interchange. These are determined by the Office of Management and Budget. The same population limit would apply to these combined statistical areas (or portions thereof) as it would to CBSAs. See, 81 Fed. Reg. 88414. Currently, NCUA uses objective and statistical requirements to determine whether an area is a well-defined local community. Under the final rule, FCUs will be able to apply to serve an area outside of, but touching, their current CBSA or single political jurisdiction by providing narrative evidence. That written narrative should demonstrate interaction and common interests among the residence of the area and the existing community, to demonstrate the area, as a whole, is a well-defined local community. NCUA will issue additional guidance on this process, but it will seek evidence on several factors regarding the proposed service area, including: presence of an economic hub and economic interdependence, population centers, isolated areas, quasi-governmental agencies, government designations, shared facilities and services and colleges and universities. See, 81 Fed. Reg. 88440. It may not be the very model of a modern field of membership rule quite yet, but it is definitely a step in the right direction. For more information on the field of membership rules and proposals, have a look at NAFCU Compliance Blog post Thankful for Proposed FOM Rules? Let NCUA Know!, the NAFCU FOM Issues webpage, the NAFCU Regulatory Alert regarding the proposed rule (members only) and the NAFCU Final Regulation regarding the finalized rule (members only). Thankful for Proposed FOM Rules? Let NCUA Know! I can’t believe it’s almost Thanksgiving – just 8 days away! And although there are many things to be thankful for (ahem - election season finally being over), I’m sure a few die-hard credit union wonks will be giving thanks for NCUA’s decision to finally implement some substantive FOM reform. Permit a credit union to designate a portion of the area as its community without regard to division boundaries when such an area is subdivided into metropolitan divisions. Although all three provisions are welcome, I want to spend a little time fleshing out the third provision since its implications are slightly nuanced. By way of background, NCUA’s FOM rules reference three different classifications for purposes of community charter FCUs: Combined Statistical Areas (CSAs), Core-Based Statistical Areas (CBSAs), and Metropolitan Divisions (Metros). Picture 1 is provided below to show how the different classifications relate to each other. Essentially, a CSA is the largest classification with the widest geographical reach (shown in purple). Often, a CSA is composed of several CBSAs (shown in orange). Sometimes, an individual CBSA itself can be composed of smaller areas, ie., Metros (shown in green). Of note, there are only 11 CBSAs deemed large enough to be subdivided into metropolitan divisions. They are listed here. Under current rules and the final rule that was just approved, when an FCU seeks to serve a portion of a CSA, that portion is not required to conform to the boundaries of the CBSA components that make-up the CSA. So as demonstrated in Picture 1, a FCU would be permitted to serve the portion of the CSA (as shown by the black circle). This would be a presumptive WDLC, even though it crosses multiple CBSA and Metro boundary lines. In contrast, when an FCU seeks to serve a portion of a CBSA as its community, (notwithstanding that a CBSA is far more compact than a CSA) the existing rule nonetheless requires such portion of a CBSA to conform to the boundaries of the Metro divisions within, if any. Therefore, under existing rules, a FCU would not be able to propose an area like the one shown in black in Picture 2 since it crosses Metro divisions, regardless of the fact that the proposed area is much smaller in size than the one proposed in Picture 1. To address this disparity in treatment of a community consisting of a portion of a CBSA versus a CBA, NCUA is proposing to permit a FCU to designate a portion of a CBSA as its community without regard to Metro division boundaries. Again, the deadline to submit comments in support of the rule is Friday, December 9, 2016. Once upon a time, I traveled from Virginia to New York with the sole goal of recording a mortgage in the office of land records. I brought with me a cashier’s check, the mortgage deed, and an affidavit signed by the loan officer and member. When I arrived at the recording office, the clerk informed me that the check I had was insufficient to cover the recording taxes associated with the property. I started writing a personal check to cover the difference but the clerk looked at the check disapprovingly. To my dismay, the land recording office would not accept my out-of-state check or any cash. I quickly embarked on a scouting trip to the nearest credit union to purchase a cashier’s check before the office of land records closed. Unfortunately, that credit union would not provide me with a cashier’s check as I was not within its field of membership as required by section 701.30 of NCUA rules and regulations. I finally ended up driving to a U.S. postal office a town away to obtain the cashier’s check and successfully recorded the mortgage deed. While I did not make it on time to take my train, I was able to enjoy upstate New York hospitality. This story inspired me to blog about a frequently asked question regarding the extent of services non-members may receive from federal credit unions (FCUs). The goal of FCUs is to “promote thrift among [their] members by affording them an opportunity to accumulate their savings and to create…a source of credit for provident or productive purposes.” 12 C.F.R. § 701, App. A, Art. I, § 2. Under certain circumstances, NCUA has permitted FCUs to provide services to nonmembers as an incidental power designed to promote credit union membership. These determinations are scattered across multiple legal opinion letters and in some portions of NCUA’s rules. We receive many questions about non-member joint accounts, so I thought I would address the issue coming off the long holiday weekend. “Shares may be issued in joint tenancy with right of survivorship with any persons designated by the credit union member, but no joint tenant shall be permitted to vote, obtain loans, or hold office, unless he is within the field of membership and is a qualified member.” See, 12 U.S.C. § 1759. Joint ownership implies the ability of one joint owner to withdraw all the funds in the account including the par value. See, e.g., Model U.C.C. § 4-403(a). Some credit unions have stumbled upon the issue when non-member join owners wish to withdraw all funds and close the account hence ending the accountholder’s membership in the credit union. In order to prevent this situation some credit unions have added language to account agreements that only allow the member joint owner to close the account. Credit unions may want to look at their specific bylaws and account agreements for similar provisions or consider working with counsel to add the necessary language to prevent non-member joint owners from closing the member’s account. Remember, even if the non-member joint owner withdraws all the funds from the account, the model bylaws have a section that allows the member a certain amount of time to bring the balance up to the par value to retain their member in good standing status. See, 12 C.F.R. § 701, App. A, Art. III § 3. Aside from the joint-ownership, NCUA rules and regulations also allow FCUs to perform certain services for non-members that are within the field of membership of the credit union such as selling negotiable checks and offering check cashing services for a fee. See, 12 C.F.R. § 701.30(a)-(b). Additionally, FCUs that are designated as “low income credit unions” (LICUs), have the ability to accept shares from non-members such as other credit unions and public units. See, 12 U.S.C. § 1757(b). For more information on LICUs, see NCUA Letter to Credit Unions 10-CU-01. Here is a picture of the cozy B&B I called home for a night while attempting to record a mortgage in Saratoga, NY. With just over a week before the February 8th comment deadline for NCUA’s Field of Membership (FOM) proposal, NAFCU wanted to remind you that we have put together Talking Points to assist as you put your comment letters together. The bankers continue their campaign against NCUA’s proposal. While NAFCU is busy in Washington disproving the bankers’ misinformed attacks, it's vital that credit unions continue to weigh in on this proposal to ensure that NCUA knows how important this relief will be to our industry and the millions of consumers who want safe and sound credit union services. NAFCU believes NCUA’s proposal will help many credit unions reach more potential members who want and need affordable financial services, and I encourage you to write a comment letter to NCUA explaining how the proposal will provide much needed relief to your credit union and membership. NAFCU has drafted individual templates for Community, Multiple Common Bond and TIP Charters. While the Talking Points should be colored with the views and opinions of your credit union, NAFCU has listed a number of helpful arguments broken down by topic. For example, the Talking Points detail how the proposal will help Community Charters expand into adjacent areas within the confines of the Federal Credit Union Act. We have also blogged about various aspects of the proposal, including posts individual to Community, Multiple Common Bond and TIP Charters. Thank you to all who have written comment letters to NCUA. For those that are still thinking about sending comments to the agency, NAFCU cannot stress enough that it is pivotal that the entire credit union industry weigh-in. Your insight is valuable to the agency. The thoughts and input you express will ultimately lead to better FOM requirements for credit unions. As you consider writing an FOM comment letter, be sure to take a look at NAFCU’s Regulatory Alert 15-EA-20, our Field of Membership Issue Page, or reach out to me directly (anealon@nafcu.org, 703-842-2266) with your thoughts. Another reminder - Monday, February 1 is the deadline to let the Defense Manpower Database Center (DMDC) know that your credit union is interested in directly connecting with their Military Lending Act database (discussed in this earlier blog post). NAFCU did join in a letter to DMDC asking to extend this deadline until March 1. Keep in mind that even without a direct connection, the database will allow credit unions to submit up to 50 large batch queries a day of up to 250,000 individual checks, but with a 24 hour turn around. However, the direct connection will allow some credit unions to connect directly to this database which may be particularly helpful to those credit unions expecting to run a high volume of covered borrower checks and/or require responses on large batches in less than 24 hours. If your credit union wants to express interest, the email address to reach out to DoD is dodhr.dodc-mb.dmdc.mbx.mla@mail.mil. Feel free to reach out directly to Brandy Bruyere, NAFCU's Director of Regulatory Compliance (bbruyere@nafcu.org) with questions. One last note for today - the clock is ticking for you or someone else in your credit union to attend NAFCU’s 2016 Regulatory Compliance School. There are only 27 seats left! Attending School is not only a great chance to learn the rules of the regulatory road, but it is also a wonderful opportunity to propel your career as a compliance leader in your credit union and community. Because seats are running out, I encourage you to check out the agenda and register today! Happy Holidays! I hope the compliance community is still in the throes of family, friends and leftovers. But for those of you stealing a second away from the holiday cheer chaos, what better way to take a mental break than to chat about FOM. So with that, welcome back to the third installment of our series of posts where NAFCU’s Compliance Blog will break down different portions of NCUA’s FOM proposal and highlight the key issues that we are looking for your feedback on. Last week, we discussed Multiple Common Bond Charters. Today, we are going to review the “Trade, Industry, or Profession common bond charter”, or more commonly referred to as a TIP charter. The existence of a “strongly dependent” relationship would hinge on the likelihood of a significant economic impact, on either or both parties, if one party were unable to continue operations without doing business with the other party. What do the TIP charters think? Would this tweaks provide you all the relief that you need in this marketplace? Does your credit union anticipate utilizing this amendment? Are there any other changes to TIP charter requirements that NCUA should consider that have not been addressed in the proposal? As you consider these questions, be sure to take a look at NAFCU’s Regulatory Alert 15-EA-20, our Field of Membership Issue Page, or reach out to me directly (anealon@nafcu.org, 703-842-2266) with your thoughts. Happy Monday!! And, welcome back to the second installment of our series of posts where NAFCU’s Compliance Blog will break down different portions of NCUA’s FOM proposal and highlight the key issues that we are looking for your feedback on. Last week, we discussed Community Charters. Today, we will review Multiple Common Bond Charters. Specifically, a look at the 5 proposed changes to various aspects of multiple common bond chartering. Allow “Reasonable Proximity” through Online Access to Services. Permit the addition of persons who work regularly for an entity that is under contract to the sponsor of the Select Employee Group (SEG) listed in its charter, provided there is a “strong dependency relationship” with that sponsor. Permit inclusion of employees of an office/industrial park’s tenants under certain conditions. Streamline application process for demonstrating Stand-Alone Feasibility so that groups with between 3,000-5,000 members would need to submit a written statement indicating that conditions exist that result in the group being unable to form their own credit union. Allow a credit union’s common bond to include honorably discharged veterans of any branch of the United States Armed Forces listed in its charter, thereby continuing their eligibility for credit union membership beyond active duty. For a comprehensive discussion of each of these amendments, be sure to check out NAFCU’s Regulatory Alert 15-EA-20. For today though, lets breakdown the permissibility of “reasonable proximity” through online services and the inclusion of SEG contractors and office/industrial park tenant employees. As all the multiple common bond credit unions out there know, “reasonable proximity” is one factor considered when determining whether a group can be added to a charter. NCUA’s rules base “reasonable proximity” on the location of a “service facility” of the credit union. A “service facility” is currently defined as a credit union branch, a shared branch, a mobile branch that visits the same location on a weekly basis, or a credit union-owned electronic facility. In order to qualify as a “service facility,” a group’s members must be able to deposit funds, apply for a loan or obtain funds on approved loans. Recognizing the advent of technology and its impact on commerce and consumer behavior, the proposal would amend the definition of a “service facility” to extend it to members of occupational select groups and pre-approved associational groups who have access to the credit union’s products and services through an “online internet channel,” such as a transactional website. The proposal explains that the “online internet channel” must be capable of accepting deposits for the member’s accounts, accepting loan applications from the member, or disbursing loan proceeds to the member. Under NCUA’s current rules, multiple common bond credit unions cannot add individuals who regularly work for an entity that is under contract to the sponsor of the SEG listed in its charter. Instead, the agency only presently allows a single occupational common bond to add these SEG contractors, so long as the contractor has a “strong dependency relationship” with that sponsor. Acknowledging that there is no distinction between a single and multiple common bond credit unions in this area, the proposal would to extend to multiple occupational common bond credit unions the ability to add individuals who regularly work for an entity that is under contract to the sponsor of the SEG listed in its charter, so long as the contractor has a “strong dependency relationship” with that sponsor. Only those employees who work regularly at the park during their employer’s tenancy would be eligible for FCU membership. The proposal notes that a credit union would not need to individual list each tenant in its charter as a group sponsor, but could instead list the office/industrial park itself. Through this streamlined approach, a multiple common bond credit union would not need to obtain letters from each tenant requesting credit union services. In the preamble, NCUA explains that a multiple common bond credit union could serve the tenant employees by obtaining a letter from an authorized representative of the park itself, such as a leasing agent. What do the multiple common bond charters think? Would these tweaks provide you all the relief that you need in today’s marketplace? Does your credit union anticipate utilizing any of these amendments? As you saw in the bullets above, NCUA proposes to look at whether a group of more than 3,000, but less than 5,000, lacks the ability to establish a new single common bond credit union. Should NCUA consider a larger number than 5,000 members for this threshold? How many actual members does your credit union believe are needed to charter a viable new credit union? Also, a holiday reminder to give yourself or someone else in your credit union the best gift this year- a chance to attend NAFCU’s 2016 Regulatory Compliance School. NAFCU is currently offering an early registration savings of $200—but it ends soon! Use code HOLIDAY by 1/8 to save. Check out the agenda. In case you didn’t see, NCUA’s FOM proposal was published in Federal Register last week, and the comment deadline has been set for February 8, 2016. With that in mind, we are launching a series of posts where NAFCU’s Compliance Blog will break down different portions of the proposal and highlight the key issues that we are looking for your feedback on. Today’s topic is Community Charters. Specifically, a look at the 7 proposed changes to various aspects of community chartering. Remove the “Core Area” Service requirement as an indicator of service to low-income persons and underserved areas in favor of annually reviewing the progress of business and marketing plans to assess service objectives within an original or expanded community. Tailor application of population cap to the portion of the area that the credit union seeks to serve when determining if the area exceeds the 2.5 million population limit, as opposed to the current practice of considering the whole statistical area. Allow Combined Statistical Area (CSAs) designated by the Office of Management and Budget (OMB) to count as a “well-defined, local community.” (Note: CSAs would still be subject to the 2.5 million population limit). Permit addition of adjacent areas to a community consisting of a Single Political Jurisdiction, Core Based Statistical Area (CBSA), CSA, or Rural District would be permitted after showing, based on subjective evidence, that the residents interact or share common interests. Recognize congressional districts as a Single Political Jurisdiction. Increase the population limit for a rural district from 250,000 to 1 million persons. For a comprehensive discussion of each of these amendments, be sure to check out NAFCU’s Regulatory Alert 15-EA-20. For today though, lets breakdown the application of the 2.5 million population cap and the addition of adjacent areas. The proposal would permit the addition of adjacent areas to a community consisting of a Single Political Jurisdiction, CBSA, CSA, or rural district, upon a showing by subjective evidence that residents on both sides of the perimeter interact or share common interests. However, the expanded community would be subject to the proposed population limits for community charters (2.5 million) and rural district charters (1 million). An ability and commitment to serve the entire expanded community through the credit union’s business and marketing plan. What do the community charters think? Would these tweaks provide you all the relief that you need in this marketplace? How do you feel about the population caps—too high? too low? just right? Any other methodologies or data that your credit union thinks NCUA should consider for determining whether or not an area is “underserved”? As you consider these questions, be sure to take a look at NAFCU’s Regulatory Alert 15-EA-20, our Field of Membership Issue Page, or reach out to me directly (anealon@nafcu.org, 703-842-2266) with your thoughts. Also, you can view NAFCU's FOM webcast on demand. For those that missed it, last Tuesday Matthew Biliouris, deputy director of the NCUA Office of Consumer Protection, along with other key agency staff, took webcast attendees through key parts of the proposed rule. The webcast will remain available on demand for one year; registration is required, but there is no fee. No matter how impeccably your credit union runs, you’re going to get complaints. Knowing how to effectively respond to a complaint is essential to long-term member happiness and proper credit union compliance. A solid complaint process can help keep your credit union free of any regulatory burdens that may result when a complaint remains unresolved. Through this webcast you’ll learn how to identify high-risk complaints and what actions they require. You’ll also be able to prepare your departments for various types of complaints and ensure the appropriate party within your credit union responds. Yesterday, the NCUA Board approved a 160+ page proposal that, if finalized, would be a comprehensive modernization of the agency’s chartering and field of membership rules. Since its Friday, we’ll stick to some high-level points for today, but NAFCU will post future blogs that provide some more details about the proposal. Allow FCUs to include adjacent areas to a community consisting of a Single Political Jurisdiction, CBSA, CSA, or Rural District after showing, based on subjective evidence, that the residents interact or share common interests. Only employees who work regularly at the park during their employer’s tenancy are eligible for FCU membership. The proposal would expand the definition of TIP to include employees of entities that have a strong dependency relationship on, and whose employees work directly with employees of, other entities within the same industry. A credit union would need to demonstrate that an entity is: (1) “strongly dependent” on the others within a TIP, and (2) shares a narrow commonality. Palate Cleanser. I met some of you at Regulatory Compliance Seminar a couple of weeks ago, thanks for attending! 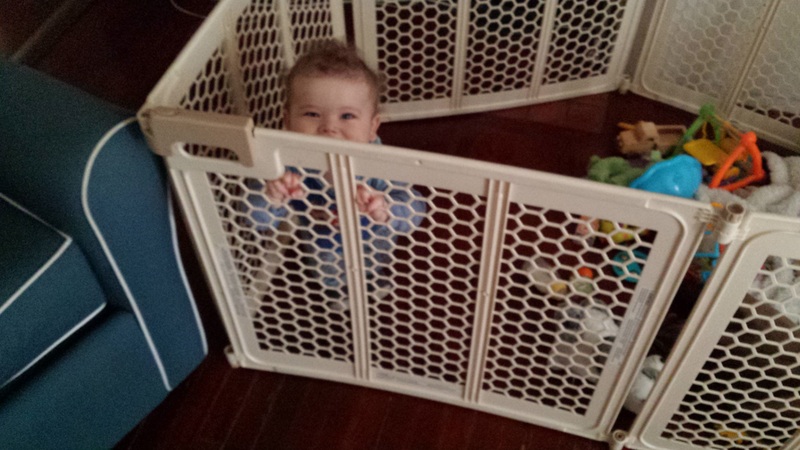 Someone mentioned that it had been a while since I shared a Nolan/Lemmy update, so here are a couple of photos from Halloween a few weeks ago and a photo of Nolan in his "playpen" which he loves to push around the room now. Have a great weekend! Happy Monday ya’ll… and happy November! October was a pretty busy month on the regulatory side. We had TRID implementation in the beginning of the month. A few weeks later, NCUA’s final RBC requirements and CFPB’s final HMDA rule dropped…on the same day! It was pretty rough. So to start off the new month, we’re going to keep it light and just give you some compliance tid-bits for your general consumption. NCUA Board Expands Small Credit Union Threshold to $100 Million- NCUA recently raised the asset ceiling for a “small” credit union from $50 million to $100 million under the Regulatory Flexibility Act. The change adds 733 more federally insured credit unions to the classification of “small entity”, and thus makes them eligible for special consideration of regulatory relief in future rulemaking and assistance from the agency’s Office of Small Credit Union Initiatives. The final rule is effective November 23, 2015. NCUA Highlights Push for Vendor Authority- NCUA has stated that acquiring vendor authority is one of the agency’s top legislative priorities. NCUA wants the ability to examine and regulate third-party service providers. Opponents of this plan argue that it will be another undue burden for credit unions; or that NCUA’s current policies requiring credit unions to exercise due diligence in their monitoring of third-party service providers is sufficient to quell any concerns. McWatters Suggests Field of membership Changes- Also in this issue, NCUA Board Member, J. Mark McWatters explains that the FCU Act can support more flexibility for credit union as it relates to field of membership. Moreover, McWatters opines that the agency’s current requirements on field of membership go beyond what the FCU Act authorizes. McWatters challenges the agency to be bold, and present to credit unions a field of membership proposal that will facilitate growth for credit unions. While acknowledging that the most significant changes on field of membership can only come from Congress, McWatters urges credit unions to agree upon and decide what changes they want to pursue and develop a plan to of action for Congress to consider. The NCUA Board delegated to the Office of Consumer Protection (OCP) its authority to review and approve community charter expansion requests involving a potential membership pool of more than one million people. Under the approved change, the Director of OCP now has the authority to approve all community charter application, conversion or expansion requests. OCP is required to request review and comment by the Office of Examination and Insurance prior to making any determination involving community charters with a potential membership pool of more than one million people. After approving a community charter conversion or expansion, OCP will continue to follow up with the federal credit union every year for three years to monitor progress. The NCUA Board reserves the right to hear appeals of any charter denials by OCP. CFPB Releases 2016 List of Rural or Underserved Counties. The 2016 list of rural or underserved counties is now available. What does that mean for you? Some businesses with volume in rural or underserved counties that outweighs volume in other counties are exempt from certain regulatory requirements in “Ability to Repay” and “Qualified Mortgage” standards, as well as escrow requirements, under TILA. You can find the list here. NCUA Proposed Rule: Investment and Deposit Activities- Bank Notes. The NCUA Board proposes to amend the maturity requirement for bank notes to be permissible investments for federal credit unions by removing the word “original” from the current requirement that bank notes have “original weighted average maturities of less than 5 years.” If this proposed rule is finalized, federal credit unions will be able to purchase bank notes that were originally issued with maturities greater than 5 years, but have remaining maturities of less than 5 years. There is a 30-day comment period, rather than the traditional 60-day period. The comment period ends on November 23, 2015. In early July, NCUA issued Letter to Federal Credit Unions 15-FCU-03, which provides guidance describing the modernized associational common bond rule. In April 2015, the Board finalized amendments to its Chartering and Field of Membership Manual that make substantial changes to how the agency will evaluate an application to add an association to a federal credit union’s (FCU) field of membership (FOM). While the preamble to the final rule provided some guidance on how to add an association to an FCU's FOM, many questions were left unanswered. For background, the modernized rule encompasses three main changes to adding an association to an FCU's FOM. First, the final rule adds a preliminary threshold determination. Second, the final rule expands the “totality of the circumstances” test to eight factors. Third, final rule also provides twelve types of associations that automatically qualify for membership. With the benefit of the recently issued guidance, FCUs now have further guidance on adding an association to its FOM. While this Letter and accompanying enclosures clarify quite a few things, for purposes of this blog, I would like to highlight the following: 1) the “totality of the circumstances” test; and 2) the updated field of membership internet application (FOMIA) – including, the procedural aspects of the application. In the accompanying enclosure highlighting the Office of Consumer Protection’s (OCP) instruction to OCP staff, it is made clear that if five specific factors in the “totality of the circumstances” test are satisfied – factors 1, 2, 3, 4 and 8 – “the association is deemed to have met the totality of the circumstances test.” However, the guidance reiterates that no single factor is controlling, in the test. 8. Separateness – whether the respective business transactions, accounts, and corporate records of the FCU and the group are not intermingled." As of now, NCUA has updated its FOMIA to include the twelve categories of associations eligible for automatic approval. Additionally, this online system provides FCUs with an immediate electronic confirmation of approval. The decision is based off of the threshold determination and the Chartering and Field of Membership regulatory requirements. FCUs seeking to add associations to its FOM that are not automatically qualifying can still receive an electronic immediate confirmation response determination of either: approved or pending, on the FOMIA. In these instances, however, the decision is based off of the threshold determination, totality of the circumstances test and the Chartering and Field of Membership regulatory requirements. It is important to note, that while FCUs may be granted an immediate response, an FCU may only begin serving members of an approved group after “the board adopts the required resolution to expand its field of membership.” Moreover, upon receipt of completed applications, OCP will respond to FCUs no later than 15 days. NCUA’s Letter to Federal Credit Unions 15-fcu-03 and the accompanying enclosures are available here. Vice Chairman Metsger’s Perspective: Wizards, Angels and Crystal Balls, Oh My! For the entire article, you can access it here. Also, for more information on the final rule, take a look at NAFCU’s Final Regulation here and blog here. Programming Note. NAFCU's office will close at noon today and will also be closed on Monday for Memorial Day weekend. We will be back to blogging on Wednesday. Have a great weekend! On April 24, 2014, the NCUA Board proposed to amend requirements relating to associational common bonds. The proposal included the addition of a threshold determination where an association formed “for the purpose of expanding credit union membership” would be rejected without further consideration. NCUA also proposed adding a factor to the current “totality of the circumstances” test that would consider, based on several factors, whether “corporate separateness” exists between the federal credit union (FCU) and the association. The proposal also listed seven kinds of associations that would be eligible for “automatic” approval. (NAFCU blogged about the proposal here and here). Yesterday, the NCUA Board held an open meeting to consider several agenda items, including finalizing new rules relating to associational common bonds. Here is an overview of the changes. When reviewing an application to add an association to a FCU’s field of membership (FOM), NCUA will now make a “threshold” determination before even applying the totality of the circumstances test to “determine if the association has been formed primarily for the purpose of expanding” FCU membership. (Preamble, p. 13). If so, NCUA will deny the addition, but if not, NCUA will then apply the totality of the circumstances test to determine if there is a common bond among the members of the association. While the proposal included a requirement that an association operated independently for at least one year prior to being added a FCU’s FOM, NCUA removed this in the final version. While the proposal would have considered several specific factors as to whether the association and the credit union maintain separateness, the final rule uses more general factors. For example, whether the association and the credit union maintain a separate physical location is no longer one of the listed considerations for separateness. Associations that have a mission based on preserving or furthering the culture of a particular national or ethnic origin. NCUA also added language stating that “each class of member will be evaluated based on the totality of the circumstances. Individuals or honorary members who only make donations to the association are not eligible to join the credit union.” See, Final Rule, p. 34. However, NCUA’s other requirements for adding groups to a FCU’s charter relating to the FCU’s capitalization, safety and soundness record, harm of an expansion on existing members, etc. will still apply. See, Preamble, p. 12; Chartering and Field of Membership Manual, IV.B.2—Numerical Limitation of Select Groups. The rule will go into effect 60 days after publication in the Federal Register. At yesterday’s Board meeting, NCUA staff advised that the agency is drafting guidance to delineate how the Office of Consumer Protection (OCP) will apply the revised totality of the circumstances test as well as clarify the due process procedures OCP utilizes when evaluating an expansion application. As you review the final rule, if you encounter any areas you believe warrant clarification in this upcoming guidance, please reach out to NAFCU’s Director of Regulatory Affairs, Alicia Nealon, anealon@nafcu.org. Palate Cleanser. Being from Northeast Ohio, it was against my better judgment but I bought my son a Red Sox shirt to make my Bostonian husband happy. Lemmy photo bombed Nolan, then just had to say hi! With 2014 coming to an end, I thought I'd put on your radar some of the more recent items released by the National Credit Union Administration (NCUA) during this very busy holiday season. MSB Exam Guidance from the NCUA. For sake of not bogging you down on New Year’s Eve, I won’t be covering this guidance in any detail here (but we’ll be sure to do so in a very near future blog post). What I do want to do is put it on your radar in case you missed it during the busy holiday season. Just briefly, what is this guidance? NCUA released Letter to Credit Unions 14-CU-10 (“letter”) to provide guidance to credit unions that provide or intend to provide account services to a money service business (MSB). In the letter, it discusses what an MSB is, the potential risks posed by MSBs, and how a credit union can mitigate those risks. Moreover, the letter advises credit unions to review the enclosed examiner guidance – Supervisory Letter No. 14-05 – because NCUA’s field staff have been provided this examiner guidance and will use it to evaluate credit unions that provide account services to MSBs. First 2015 Grant Round for Low-Income CUs. With an application period between February 2 and March 3, 2015, NCUA is inviting applications for low-income credit unions interested in providing staff training or hiring interns through use of funds from the Community Development Revolving Loan Fund. NCUA has stated that it will provide at least $360,000 in funding during this first grant round in 2015, which will cover more than 100 requests from low-income credit unions for internships or staff or volunteer training programs. If you are designated as a low-income credit union, check out the NCUA’s announcement here for more information and how to apply. NCUA Assessment Update - Stabilization Fund –posted on December 16th, the video is based on information presented at the July 2014 NCUA open Board meeting. New Economic Update Video – posted on December 23rd, this video covers the latest economic activity, the 2015 economic outlook and the performance of federally insured credit unions during the third quarter. New NCUA Video Outlining Field of Membership Options and Strategies – posted on December 29th, the video provides an overview of the various field of membership types available to federal credit unions and briefly identifies expansion and conversion opportunities available for each field of membership type. Programming Note. NAFCU’s offices will close today at noon for the New Year and will reopen on Monday, January 5. Happy New Year to you all! We’ll be back to blogging on Monday. CFPB Extends Privacy Notice Comment Period. On Wednesday, the CFPB extended the comment period for its proposed rule regarding annual privacy notices. The substance of the proposal remains unchanged, but the deadline for comments has been moved from June 12 to July 14. A brief summary of the proposed rule can be found in our May 9, 2014, blog post. Furthermore, NAFCU has published a Regulatory Alert regarding the proposed rule (NAFCU member log-in required to access the alert). More on NCUA’s Associational Common Bond Proposed Rule. Our April 25, 2014, recap of the April NCUA Board Meeting included a brief summary of NCUA’s Associational Common Bond Proposed Rule. The summary covers two of the three parts of the proposal: the new purpose of formation threshold and the new factors regarding corporate separateness to the “totality of the circumstances” test. When a federal credit union applies for one of these groups to be added to its field of membership, the proposal would call for the associational group to be automatically approved, thus not having to go through the threshold or “totality of the circumstances” determinations. While the proposed rule identified the above groups for this fast-track approval, NCUA is seeking public comment on whether other categories of associational groups should be included when the final rule is released. Comments on this issue and the rest of the proposed rule are due by June 30. This is the first instance, that NAFCU is aware of, where NCUA has publically announced this quality review process. That said, the agency notes that it is already in place and is an ongoing program run by NCUA’s Office of Consumer Protection. The program reviews associational groups on a case-by-case basis to determine their compliance with the current associational common bonds requirements. While nothing in the proposal would change this program, NCUA chose to highlight it in the proposed rule in light of the agency’s increasing concerns that federal credit unions are artificially using associational groups for the sole purpose of increasing a credit union’s membership. This concern is also highlighted in NCUA’s September 2013 Letter to Federal Credit Unions where the agency stated its concerns regarding advertisements that claim that a federal credit union’s fields of membership is “open to anyone.” NAFCU will continue to monitor and talk to NCUA about this quality review process. Lastly, NAFCU has released a helpful Regulatory Alert (NAFCU member log-in required) on the proposed rule, and is currently in the process of developing a comment letter on behalf of our members. NAFCU member credit unions that would like to provide us with input that can be used in our comment letter are highly encouraged to fill out our Associational Common Bond Survey by June 6, 2014. Free Kick. I am taking a break from my World Cup group previews, so that I can take a moment to express my joy over the fact that the long, nine-year wait for silverware has finally come to an end! It wasn’t pretty, but somehow Arsenal was able to claw their way back after digging themselves an early 0-2 hole in the FA Cup Final. I still believe that the squad needs to be improved during the summer transfer window, and Arsene Wenger must do a better job of ensuring that the team doesn’t start big matches in such a flat manner. That said, I will categorize this season as a success. Well done, Gunners! Proud to be a supporter of the 2014 FA Cup Champions!!! Programming Note. NAFCU’s offices will close at noon today for the Memorial Day Holiday and will reopen on Tuesday, May 27. We will be back to blogging on Wednesday, May 28. Remittance Rule Safe Harbor List; November Compliance Monitor Available; Meet the NAFCU Family (Fun Video Alert)! Remittance Rule Safe Harbor List. Yesterday, the CFPB published a notice of the current safe harbor list of countries that qualify for an exception in the remittance rule. The list, effective concurrently with the final remittance rule on October 28, 2013, remains unchanged from the initial release on September 26, 2012. To provide some background, the final remittance rule generally requires remittance transfer providers to give consumers sending remittance transfers certain specified disclosures, including the applicable exchange rate, any fees imposed and taxes collected by the provider, and covered third-party fees. The safe harbor list provides an exception: it permits estimates of certain disclosures when a remittance transfer provider cannot determine the exact amounts it must disclose at the time the disclosures are required because the laws of the recipient country do not permit such determinations. The list currently contains the following countries: Aruba, Brazil, China, Ethiopia, and Libya. The CFPB intends to revise the list periodically; however, none of the countries currently listed will be removed from the list prior to July 1, 2014.
the latest Compliance Calendar is also available. NAFCU Video. Ever wonder who you’re speaking with when you call in to NAFCU? Or even who is behind these crazy blog postings? Well wonder no more! Meet the folks that provide you with Extreme Member Services every day. This video will definitely make your Wednesday! We'll try to keep it short and sweet for Friday. NCUA Board Meeting. NCUA held a busy Board Meeting yesterday. A good resource for an overview of NCUA's actions is their Board Action Bulletin. The NAFCU Today also has additional details: Small CU; Payday Alternative Loans and Treasury Inflation Protected Securities (TIPS) and rural district definition. Boardmember Hyland. After the Board Meeting, Boardmember Hyland announced it would be her last as a NCUA Boardmember. She will officially leave the NCUA Board on October 5th. Hyland's official term ended in August 2011 but she remained on the Board to ensure NCUA had a three-person Board to lead the agency. More in the NAFCU Today. Director Cordray. Yesterday, Director Cordray testified before the House Financial Services Committee. This is after testifying before the Senate Banking Committee last week. Additionally, the CFPB announced the first meeting of their Consumer Advisory Board: September 27th in St. Louis. Attendance is open to the public but RSVPs are required. NAFCU Member Video. Back in July we blogged on our NAFCU Member Video Contest. Check out the winning video here. After a long week, it is a real good laugh. Well done Baylands FCU!! FICUs could participate in a share placement service similar to CDARS but it would most likely be feasible only for funds from "public units," which includes states, municipalities, and political subdivisions. 12 C.F.R. §745.1(c). Although, generally, NCUSIF coverage only extends to member accounts, federal credit unions, and we believe most state-chartered credit unions, may accept funds from public units or government depositors without regard to membership. 12 U.S.C. §§1752(5), 1757(6).For purposes of NCUSIF coverage, nonmember public unit accounts are insured as member accounts. 12 C.F.R. §745.1(b). Emphasis added. That's a part of the FCU Act and NCUA regulations that some in our industry forget. Each and every "public unit" is eligible, which includes states, municipalities and political subdivisions. So, if you are every looking for deposits, this might be fertile ground to investigate. Note that there are limits, which are spelled out in the regulation that governs such deposits. Last week, NCUA issued a LOL (legal opinion letter. Not laugh out loud. Come on, people!) to clarify what constitutes a "service facility." More specifically, NCUA clarified that a website just doesn't cut the mustard. The current Chartering Manual definition of service facility provides multiple common bond credit unions with several options for the types of facilities it can use to serve its occupational and associational groups. A credit union’s Internet website lacks a physical presence so cannot meet the statutory requirement to be within reasonable proximity of the groups. If you serve multiple occupational and/or associational groups, this legal opinion letter provides a good overview of "service facility" requirements. Access the letter here. Here's a link to the most recent NCUA newsletter. These newsletters do a good job of highlighting recent developments. But they also contain an order form for NCUA documents and publications. Yes, my Steelers did win last night. Here are my three rules to obey when your team wins the Super Bowl. You may not gripe about your team in any way for 5 years. Do not buy Super Bowl merchandise. It will be tempting. But it becomes dated. And believe me, no one else cares that your team won the Super Bowl. Refrain from talking about the game with fans of other teams. If they bring it up, simply state that you're happy to get the win and that you're glad that you don't have to play them again. If you start talking about the game beyond that, you'll say something stupid. Believe me, I know from experience. As someone who works in compliance, I've found that there are certain websites or documents that I consult on a daily basis. But there's always one hole I fall into when I speak with a credit union concerning questions about whether a prospective member falls within their field of membership. I don't have the credit union's approved field of membership. If you are in compliance, ask yourself this question. Where can I find my credit union's most up-to-date field of membership? And I don't mean the one on your website. I mean your official field of membership. If you don't know the answer to that question, I would find it and make a copy or scan it. I would guess that 50 percent of the questions we are asked about field of membership are answered with this statement. What does your field of membership say? If you have it handy, your answer is within reach.